Carol Rodland, enjoys a distinguished international career as a concert and recording artist and teacher. First prize winner of the Washington International Competition and the Artists International Auditions, she made her solo debut with the Philadelphia Orchestra as a teenager. Critics describe her playing as "larger than life, sweetly in tune, infinitely variegated", and "delicious" (Fanfare Magazine). Ms. Rodland’s performance calendar includes regular collaborations with her sister, organist Catherine Rodland as the Rodland Duo as well as with pianists Marcantonio Barone and Tatevik Mokatsian, and cellist Scott Kluksdahl. She also performs frequently with the Portland Chamber Music Festival and the Halcyon Music Festival and for twenty years was a member of the Craftsbury Chamber Players. Other recent chamber music collaborations have included appearances with the Boston Chamber Music Society, the Central Chamber Music Series, and the Henschel Quartett. Festival appearances have included the Musikfestpiele Saar, the Schwetzinger Festspiele, the Heifetz International Music Institute, the Killington Music Festival, the Chautauqua Music Festival, and the Green Mountain Chamber Music Festival. A passionate advocate for contemporary music, Ms. Rodland has commissioned, premiered, and recorded new works by Kenji Bunch, Dan Coleman, Adolphus Hailstork, David Liptak, Christopher Theofanidis, and Augusta Read Thomas. Her recordings on the Crystal and Neuma record labels have been critically acclaimed. A dedicated and much sought-after teacher, Ms. Rodland is Professor of Viola and Chamber Music at the Juilliard School. She is also an artist-faculty member at the Perlman Music Program, the Bowdoin International Music Festival, and the Karen Tuttle Coordination Workshop. 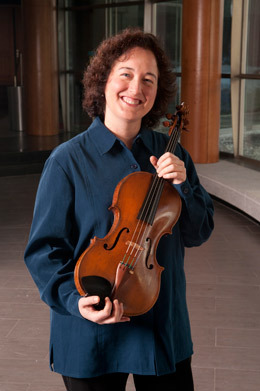 Previous positions have included professorships at the Eastman School of Music, where she was also Co-Chair of the String Department, at New England Conservatory, where she was recognized in 2005 with the "Louis and Adrienne Krasner Award for Excellence in Teaching", at Berlin’s "Hanns Eisler" Hochschule, and at Arizona State University. Recent guest teaching residencies have included master classes in the United Kingdom at the Royal College of Music in London, in Germany at the Hochschule Fuer Musik und Theater in Saarbruecken and at the Universitaet der Kunste in Berlin, in Norway at the Valdres Sommersymfoni, in Tel Aviv Israel with the Perlman Music Program, and in the United States at the Juilliard School, Oberlin Conservatory, Boston Conservatory, New England Conservatory ,Indiana University, University of Michigan, and the Walnut Hill School. In 2019, she will give master classes at San Francisco Conservatory and the Moore’s School of Music at the University of Houston and will also serve as a jury member, master class clinician, and featured recitalist at the Lionel Tertis International Viola Competition and Workshop at the Isle of Man, United Kingdom. Ms. Rodland is the founder of "If Music Be the Food...", a benefit concert series created in 2009 to increase awareness and support for the hungry in the local community through the sharing of great music. Teaching music students about the importance of utilizing their art for service in their communities is also part of the series’ mission. "If Music Be the Food..." is a fully volunteer endeavor; all of the musicians donate their services, the venues donate the performance spaces, and audience members bring food or cash donations for the local food bank as the price of admission. "If Music Be the Food..." has inspired other prominent musicians to implement initiatives based on this concept in their own communities. Ms. Rodland holds Bachelor and Master of Music Degrees from the Juilliard School, where she studied on full scholarship with Karen Tuttle and was the winner of the Juilliard Concerto Competition and the Lillian Fuchs Prize. She also received an Aufbaustudium Diplom awarded with distinction from the Musikhochschule Freiburg, Germany, where she studied as a Fulbright Scholar and Beebe Fund Grantee with Kim Kashkashian. She had the unique privilege of serving as teaching assistant to both of her mentors. She plays on a viola made by Vincenzo Panormo in 1791 and a bow made by Benoit Rolland in 2010.